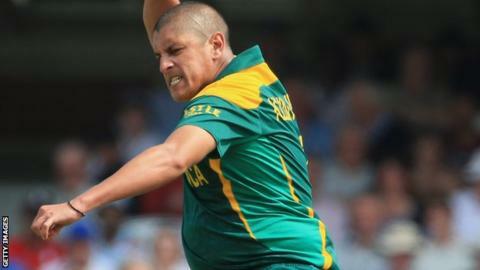 Northamptonshire's injury crisis has continued with the withdrawal of South Africa all-rounder Rory Kleinveldt. Cricket South Africa has pulled the 31-year-old out of a deal to play for Northants because of a knee concern. The Wantage Road side had already lost initial overseas signing, Australia bowler Jackson Bird, to injury. One-day captain Alex Wakely is out for the season with a ruptured Achilles tendon, while David Willey will miss Sunday's Division One season-opener. All-rounder Willey has a back problem and will not play when Northants face Durham in their return to the top flight of the County Championship. In a statement the club said: "Rory was due to arrive in the UK on Wednesday and the late decision by Cricket South Africa is extremely disappointing. "Northants will continue in their search to bring an overseas player to the club for the 2014 cricket season."